As promised, I want to make my art files available, so that anyone doing a similar project can benefit from my work. All that I ask is that you send me some pics of your hard work! 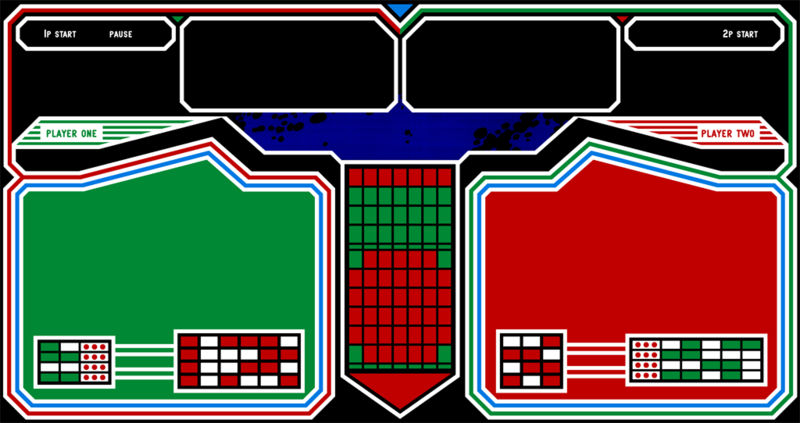 First off, here is my Control Panel Overlay. Get it here! Here is the partial original version that I started with. Get it here! 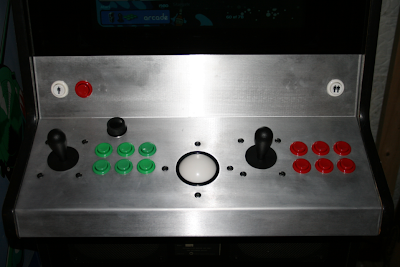 For comparison, here is my final design, along with the original panel. 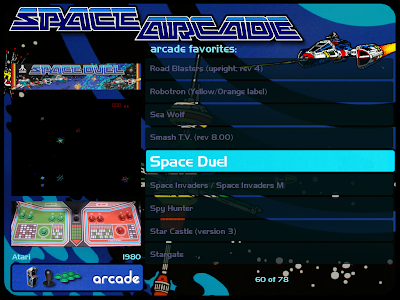 As with the rest of my custom work, I wanted my new graphics to fit the original Space Duel theme. Now for the marquee. I have already posted the photos of this earlier on in the blog, but I will post it again so all of the artwork is together in one place. My Marquee. Get it here! Original Marquee. Get it here! Enjoy! I hope that by putting these files out here, I am able to help someone else out and save them some time. Feel free to contact me if you have any questions or have any trouble with the files that I have linked. 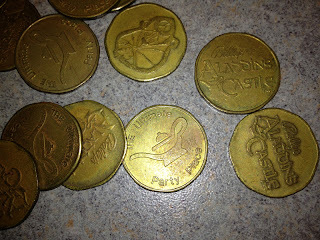 When I was a kid, the arcade that I spent all of my time and money in was Aladdin's Castle at our local mall. I had a birthday party or two there and that's what comes to mind when I think of what an arcade should be. Because of this, I have been looking for Aladdin's Castle tokens since I got my machine up and running. 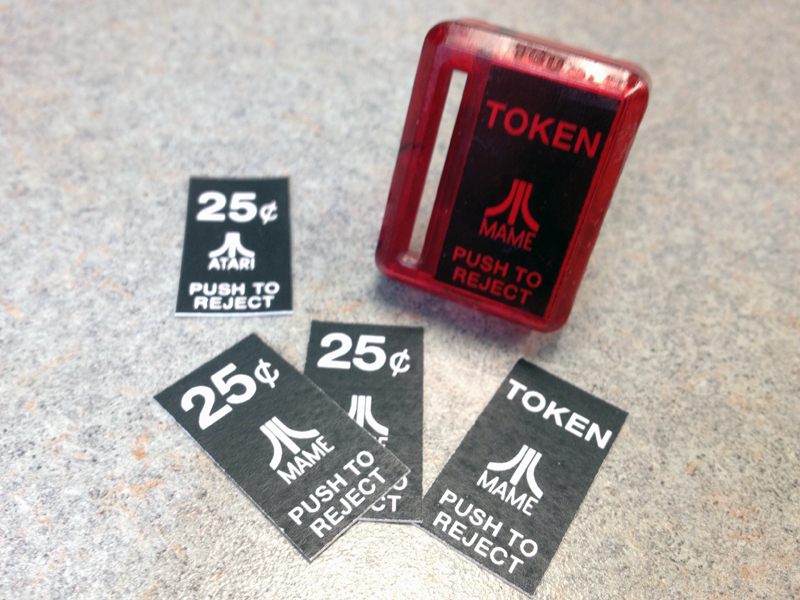 Recently, I was able to pick up some tokens, so I took it upon myself to update the coin door graphics to match the switch to tokens. I simply printed them on cardstock with a laser printer and then cut them out. If anyone is interested in the source files, here they are. Feel free to use them as you wish. If anyone stumbles on this blog and has some of these Aladdin's Castle tokens laying around, send me a message and I will gladly take them off of your hands! Overlays, Motherboards, and USB ports, oh my! 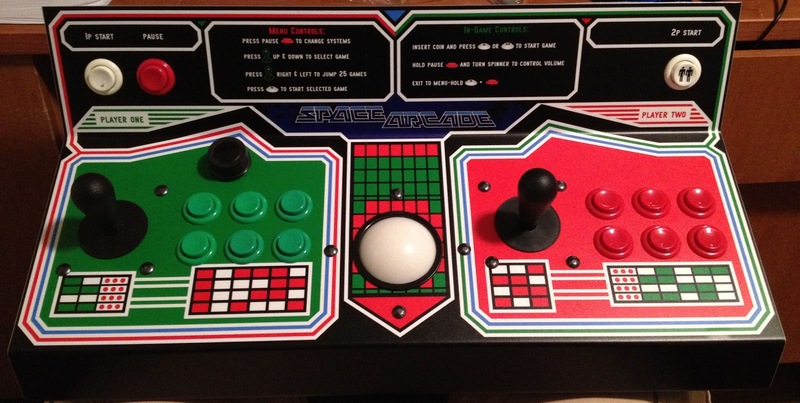 Also, I finally got around to ordering the marquee and control panel overlay from http://www.gameongrafix.com (formerly mamemarquees). They turned out better than I expected. The overlay has held up well with some aggressive playing and isn't showing any signs of wear. I will upload detailed photos of each later when I get home. 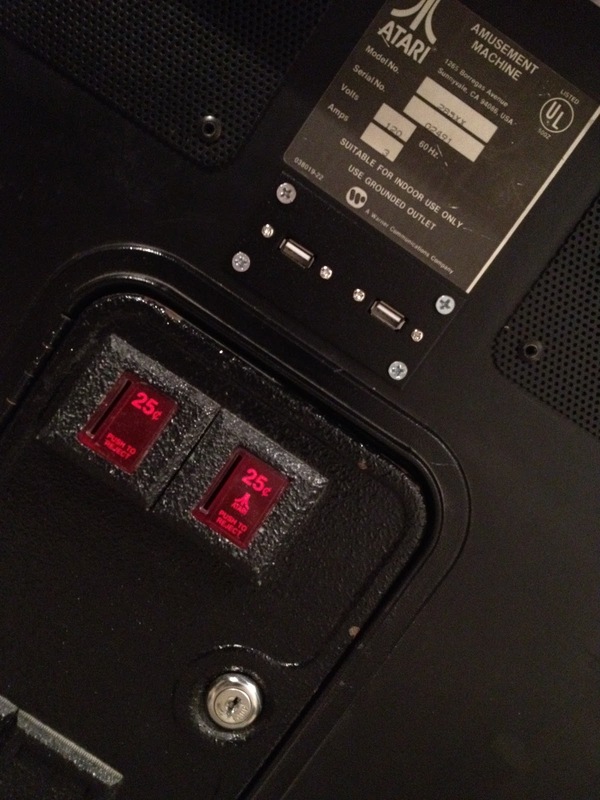 Also, I added a panel above the coin mechs with two usb ports. This combined with the two playstation dual shock clone usb pc controllers I got off of ebay and now, for games like TMNT, X-Men, and The Simpsons, I can plug in two controllers and we can play 4 players! I still need to get black, round headed screws to hold the panel on, but it works great as is! Thats it for now. As usual, if after reading through all of this, you have any questions, feel free to drop me an email--I'll be glad to help! Space Duel is up... Two Tigers is on deck! I attached it to the cab and voila! It was perfect! Everything fit and was arranged where it was supposed to. That's quite a few controls squeezed into 24"
I also printed out a temporary marquee using the graphic that I had designed on some glossy Kodak photo paper that I had sitting around. (I got tired of the marquee light shining in my eyes) There are two seams that you can see, but it looks good for a temporary fix till I order the Marquee and Control Panel Overlay from mamemarquees.com. not bad for plain 'ol photo paper, huh? I still have some tweaking to do to narrow down the lists of games, get screenshots working for the n64, genesis, nes, and snes games, as well as other software tweaks. Although there are a few little things to do, the machine is up and running and is already a hit at parties. 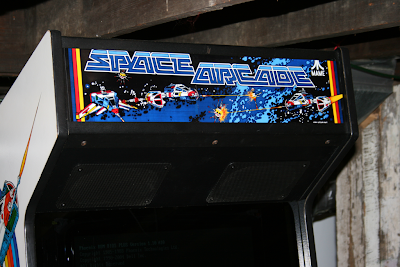 Space Arcade up and running... but wait! who is his friend? So now that the fun stuff is finished, its time to start another project, right? You bet! 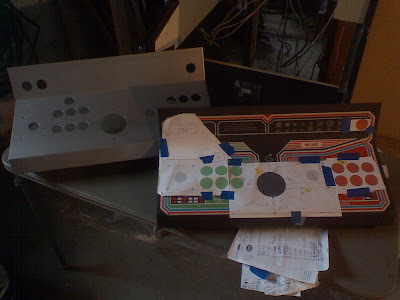 My wife's uncle, who manufactured the metal control panel, told me that he would be interested in having an arcade cabinet of his own. So off to the forums and classifieds I went to find myself a new cab. 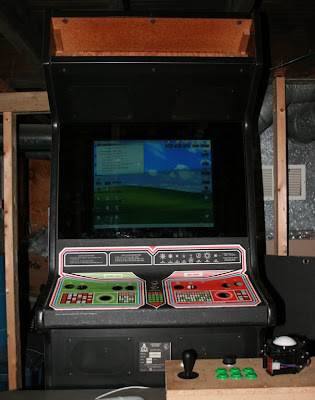 I have casually been looking for the past month or so, and last week I wondered onto the buy/sell/trade forums at Build Your Own Arcade Controls and found a cabinet within an hour of my house being offered for free! I jumped on the deal and picked it up this weekend. It was originally a Two Tigers game that was converted into a P-47: Phantom Fighter. 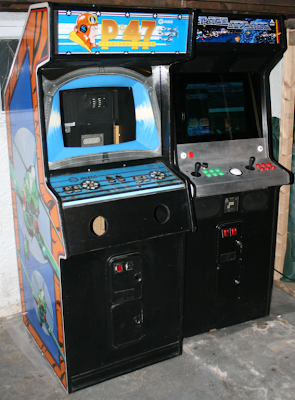 The cabinet is in great condition, and with a little love and elbow grease, it should make a fine MAME Cabinet. This project will only move as fast as I get money from Jeff to work on it, so I don't know how long it will take to finish, but regardless, it should look pretty awesome when it's done. Questions? comments? suggestions? drop me an email! look ma, I have an interface gui! Since I installed my monitor last month, I have been working on the graphics for my interface, setting up emulators, tracking down screenshots, etc. 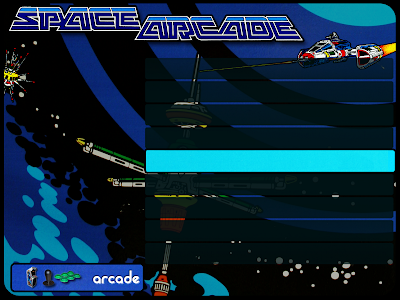 I am still configuring the other emulators that I plan on using, but MAME is finished... and so is my interface design. 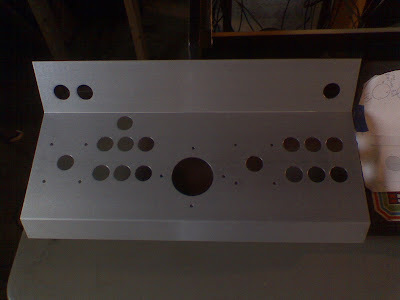 On my way out the door to work this morning, I was met by my wife's uncle, Jeff, who has been working on a new metal control panel for me. He had stopped by to give me the first prototype. One thing that I noticed right away, it that this new aluminum panel weighs half as much as the steel original. After a quick test-fit, it looks like one of the bends needs to be bent in a bit more and the top and bottom rows of buttons need to be placed closer together. Other than that, it looks good. 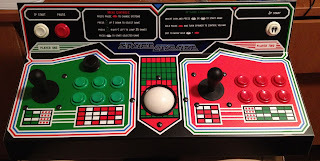 I will find out more tonight when I try to fit some controls in the panel. Hopefully after a few tweaks, I will have a shiny new panel to install!! After a busy summer, and a few missed deals on monitors, I am back with some progress. The other day, I was scouring Craigslist for deals on 20 or 21 inch CRT Monitors. I emailed a few of the sellers, and got a response from one guy, Rick, that said he still had his for sale. It was a 21" IBM monitor that wasn't too far away, and the best part... he was selling it for $10.00!! He said it was in excellent condition and the photos looked good as well, so I promptly contacted him and arranged to pick it up. Thanks for the great deal, Rick!! After I got home with my shiny new monitor, I tested it to make sure that the picture quality was good, and then I started to install it in the cabinet. 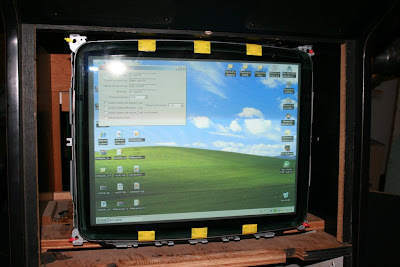 First, I took the monitor out of the plastic casing. I wanted to see if I could get it to fit onto the existing shelf that was in the cab. After some slight modifications to the cab and a lot of elbow grease (the monitor weighs a ton) the monitor was finally in the cabinet! calling this a tight fit is an understatement! 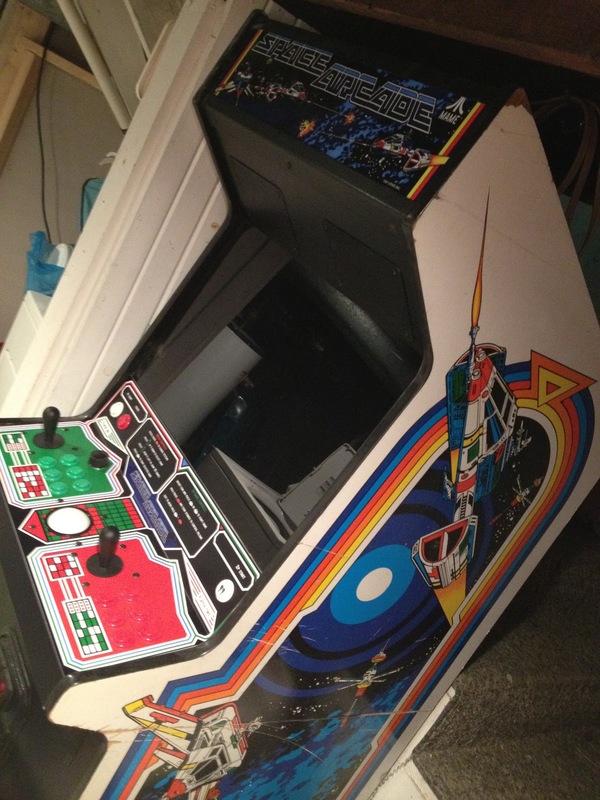 starting to look like a real arcade machine! Also, I hacked up a pair of powered computer speakers and wired the four speakers that came with the cab to the circuit board and they all sound great. As I understand it, most computer speakers are 4 ohms and usually the speakers in arcade machines are 4 ohms as well. So all I had to do was remove the old speakers and solder the new ones to the board. Some people use car speakers in their cabinets, and those are usually 8 ohms, so you cannot directly connect it like I did. Also, I have changed my mind about what front end to use. 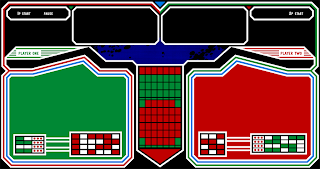 I may switch to Hyperspin later, but I would rather stay with the Space Duel themed art, so I am designing my own layout for the frontend MaLa. I am almost finished with it, as soon as I am, I will post what it looks like and make it available to anyone that wants to use/modify it. I think thats all for now... I will be back with more progress soon! That would make a great addition to the game room. That may be the next project that I tackle after I find a good condition 21" monitor that fits my cab so I can finish this beast! 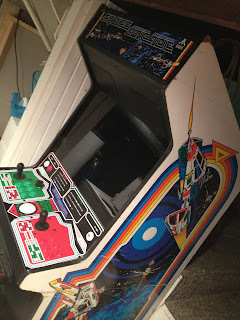 I just got news that Eric has completed some serious detail on the Space Duel sideart project. Check out the progress at Rotheblog.